There aren't any airports in or train routes to Yosemite, and cruise ships pull too much draft to navigate up the Merced River, so your trip to Yosemite is almost certain to involve a car or bus at some point. If you don't live in the American west, you may want to fly to California and then rent a car. 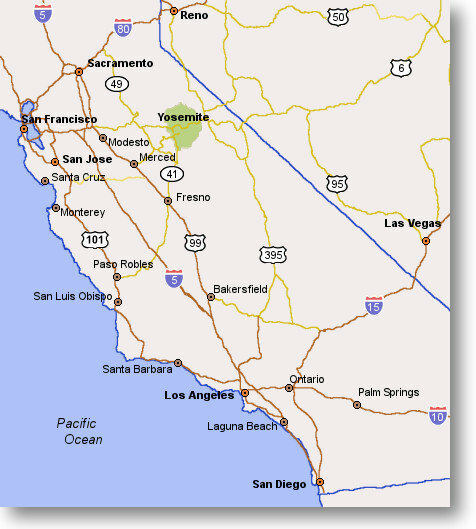 In addition to the major cities like San Francisco and Los Angeles, there are airports in several of the smaller Central Valley cities that lie closer to Yosemite. The table below lists distances from a variety of airports to Yosemite; you're welcome to pick your favorite based on terminal decor, food court, or whatever else you prize most highly in an airport. * Yosemite's eastern entrance, via Tioga Pass, is usually closed from November through May due to snow. See the Road Conditions page for the road's historical opening and closing dates.